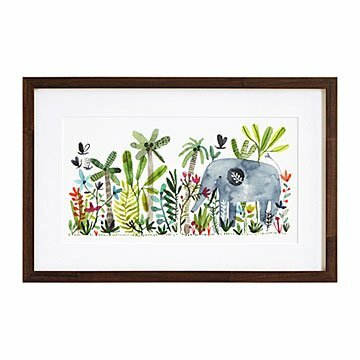 An adorable elephant plays in the jungle in Carolyn Gavin's print. In Carolyn Gavin's lush image, an adorable elephant plays among palms, flowers, and butterflies. This jungle fantasy is full of colorful forms faithfully reproduced from Carolyn's original watercolor and gouache painting. Having grown up in South Africa and traveled throughout Europe, Carolyn brings her love of exotic color and natural beauty to this lively design. The print makes wild and wonderful decor for any safari-loving child's room. Designed in Toronto. Printed in Portland, Oregon.